But check the earth straps and that the plug on the back of the alternator is secure before buying a new one. And buy a 3.0 litre. Would my splashing about in puddles have been a possible cause of above issue too?? Will check alternator tmr. Don't it drive you nuts?......reset it please or I won't be able to sleep tonight... ..
right had a looksie today and can see one cable leaving driverside negative battery pole heading down to alternator, is the anymore that could be hiding on me??? check voltage between white lead and chassis and i have 11.98v, am i right in thinking alternator is fubared??? Bob I reckon that lead is the battery postive to the alternator, thats why you got battery voltage when checking to earth. With that lead connected and engine running does the voltage increase? Usually @ around 2500 revs you should be seeing around 14v at the battery, then with headlights, heated rear screen and heater blower on, the same revs should give between 12 and 13v. If you aren't seeing those figures chances are the alt isn't charging. The negative cable from the battery does not go to the alternator, it goes to the engine block or chassis. Check that the bolts securing the alt have good contact with both the alternator housing and their respective fixing points. As Vince says, the grounding is done through the housing, so if the fixing bolts and the parts of the housing they contact are scaled up, your ground connection will be poor at best. I can see where the earth from the battery is bolted onto the main engine block and all seems sound there as well.... Will have another look tomorrow. Can't remember, offhand, whether alternators also require an external voltage to their field winding, or whether they rely on residual magnetism initially and then draw that voltage from the rectifier pack once upto speed. 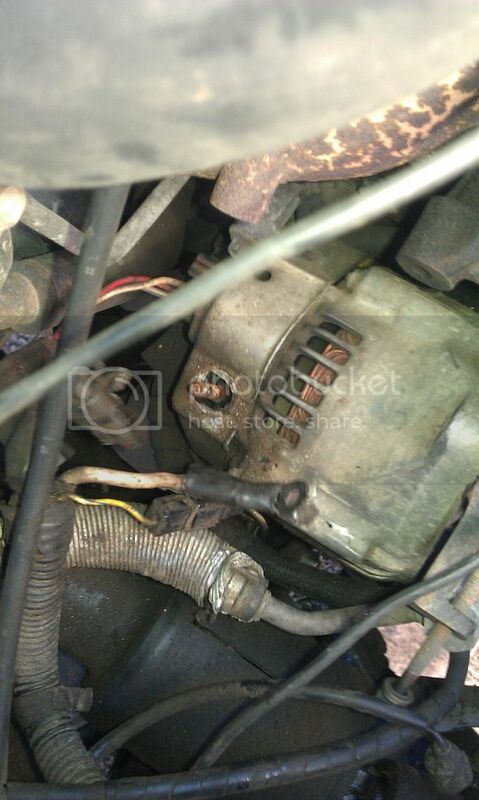 What are the three connections to the back of the alternator? One of those should be an ignition switched live, if I recall correctly? Possibly. Alternators are bloody weird things. Can never, for the life of me, remember exactly how they're setup to work.